Another superb book find that kept me reading non-stop until I was done. I want to say “WOW!” but this book deserves more then just a wow, for me. And anyway, “wow” is almost a little too loud for this serene yet agitating read. Deep, but in a “hopeless romantic” kind of way. Beautifully written and gentle in it’s approach. Angst-y, yes, but bathed in a delicate, reassuring tone. It’s subdued, building slowly until your heart just can’t take it anymore, until finally you say ENOUGH please… it hurts. A little give, a lot of take, when it comes to the readers emotions, but, isn’t that what us book-angst-addicts are all about? Moments of sweet relief only to be “caught up” again in the heroine’s head. Seeing things from our perspective, and yet feeling things from hers. 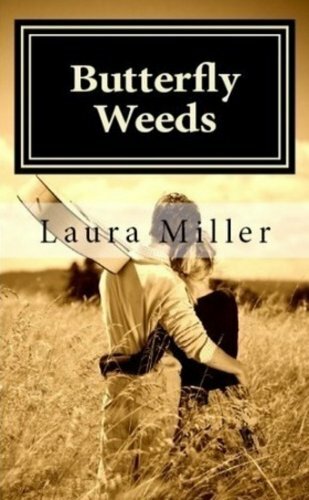 Kirstie: Butterfly weeds by Laura miller was amazing! Its a modern day notebook with a rockstar. I pity the book I read after it! Mandy: I liked this book too, it made me cry at the end! Kristie: I felt like I cried the whole book. I thought their love was beautiful! Amy: Ok so I’m 70% in and cannot stop reading. I’m going to need lots of coffee in a few hours!!!! I have been in such a reading slump since The Sea of Tranquility but I think I may have found its match!! And who knew I could fall in love with another Will……. Yep. “Cry”, “rock star” (in this case – country star) and “Sea of Tranquility” were definite motivators for me. Loving a book so much that you wonder what you can read after it? I LOVE books like that, and after a few rocky book starts from my TBR list, I found myself in this one, last night. It was a reading relief despite the emotional upheaval being inflicted upon me. Did I cry? Hehe. Oh yeah. My throat muscles were hurting so bad by the end from trying to keep it together, but at a certain point, I gave in. And gave in BIG. (thank goodness for my Facebook crew! I was not alone in my mini-melt-down). Maryse’s Book Blog: Ok I’ve had a few start & stops reading wise over the last 48hrs, but OMG this one HAS me. It’s been mentioned a few times, and it’s just so heartwarming and sweet and I’ve been sighing like crazy. Then I hit 20-something percent and I felt a familiar ache and at 30-something percent now and my heart just stuttered. Ohhh wow I’m going to love this, I know it. Susan: What a Great Book!! It will make your heart very heavy!!! Loved it!!! Kim: I loved it!!!!! It is a great story. I should’ve told you a long time ago!!! I cried at this one it just was so darn sweet/touching by the end!!! Dee: Thanks for the heads up! I bought it. Julie: Yes!! Amazing book!! This author really keeps you on your toes til the end! Maryse’s Book Blog: Amy I’m scared of the ugly cry!! Amy: Don’t be scared bc it is so worth it!!! Just be prepared since I’m giving you time to prepare. I was seriously contemplating going to the last chapter bc I needed to know the ending (and I’ve only done that once before) but I stuck it out & boy was I glad I did. I can’t wait to hear your thoughts on it. Mint: You get me curious, Maryse!!! I have never dropped my current read to jump into something else. But that’s about to change now. Megan: Ha ha stupid ugly cry, okay it is now moving right up the list! Amy: Yay!!!! Stupid ugly cry . Seriously though how could you not cry at the end… Will! Kristie: It was best book I’ve read! So far! And when my husband noticed I was in my “after-book-mope-mode” he humored me, and listened to the whole thing while I recounted it. Sure enough, my voice broke when I told him the end. He nodded and and gave me his own take… said something enlightening (but I can’t say it due to spoilers). But all that to say, he “got” it. *sniff sniff* It’s just soooo beautiful. So what’s it about? It’s somewhat of a traditional (yet contemporary) love story, reminiscent of something we might see in a blockbuster movie (my husband brought up Christmas Hallmark movie… again. *sheeesh* that boy and his Christmas movies.). The feel of this one is… “considerate” in it’s angst. It doesn’t beat you over the head with it, or get too crazy (although… we all know I enjoy that too! *grins*). This one tenderly builds to the point of no return. OK I admit, I rolled my eyes BIG TIME, once, but only in frustration, and I was still loving it despite my need to shake someone. Will and Julia have known each other and have been best friends since they were children. They ran through the gamut of childhood miseries (him teasing her like the brat he was), until later in their teens, she realized he was no longer looking at her with his annoying smirk. In fact, it was more of a longing gaze. And she saw him in a new light. Yep, it was him – the same guy. He looked so different now. The handsome man that he was becoming, the talented country singer/songwriter that would play his guitar quietly just for her. “That’s what I’ve waited my whole life to hear,” he said, smiling, as he kissed my forehead and then retook his place beside me. We returned to unreserved silence then, as if emptying our souls without a word. It was funny how the same lips that had always incited so much speech – usually scolding – could also take it away so effortlessly. And what an AMAZING man he was proving to be. *sigh* Now THIS one had me swoooooooooning. There doesn’t seem to be a bad-boy bone in his body, but he’s everything that could make a girl fall head over heels. His mama raised him right! *blush* (I couldn’t help myself, I had to say it!) Wait… wait! Of course I like ’em bad-boy (and I’m sure plenty of their mamas raised ’em right, too). 😉 But you know. You just can’t help but fall in love with Will. And neither could Julia. And as reality would have it, life gets in the way. Plans for the future, that just might not coincide. Can the beauty of everything they are together, everything they once gave to each other, be enough to withstand the trials of life? And therein lies the story. Is this just a matter of “high school sweethearts” moving on, or… I’ll stop there. In the end, I had to believe that when all of the pieces were touching, they would leave behind a beautiful depiction of life. And I knew that if Will and I could somehow find a way to be together in the final act that we would always find a way to combine the jagged pieces to construct a beautiful ending. A gorgeous, enlightening, absolutely captivating read! I’m going to give it 4.5 stars. I want to say a 5 star read for me, except for one thing. And I can’t even say it here because it would give away too much. My husband however, gave me a different perspective on it (very sweet and I totally saw his point), but he agreed that this was the perfect opportunity to ask the author for… more. Please Laura? I knew you would like it!!!! The end of the book ahhh well I would definitely read more from this author!!! I grabbed this one – I have been looking for something to read after Sea of Tranquility. OMG, just finished this 5 minutes ago & I cannot stop crying!!!! Such a good book aaarrggghhh!!! Beautiful!!! Now what to read to lift up my spirits?!?!? Do you want super funny, light romance, or super funny with some angst, romance? My gosh, Maryse! I am crying my eyes out. Of course, I downloaded this book the moment you posted your review and have just finished it. I cried so hard the words were blurring…I had to turn my IPad off and get it together before I continued reading!! Great recommendation and I think I will definitely be reading the Chocolate lovers series now for some good laughs. Good lord. This one KILLED me. Like a blockbuster movie is right!! I had made it through most of the book alright. Im thinking “what is she talking about with all this crying?” And then BOOM….the flood gates were opened. Thank God my husband went to bed because I was a sobbing, snotty mess. Crazy! But I love love looooved it. I thought her writing was brilliant. This is definitely on my top 10. One of those I would absolutely reread. Thank you, once again, for a fab recommendation. Oh man…. it’s downloaded and waiting for me to finish Creed!! Can’t wait!!!! Guys I’m about 55 percent in and your freaking me out… Is the a HEA please no Opportunist moments for me I NEED A HAPPILY EVER AFTER…..Should I stop reading? Just finished this. Took me a day. If I didn’t have to pay attention to my kids would have been less! JK. Was such a breath of fresh air. Been reading to many bad boy books. Thank you. Yes!! It was touching and just… a great book to “switch it up” a bit. Just finished. WOW. Loved it. Wow, wow, wow! What a wonderful, beautiful story, I had butterflies in my stomach slot during this story! Thank you Maryse for yet another great book suggestion. Speechless. I loved how this book kept me captivated and enthralled. Big mistake was reading the ending right before work. I was a walking blotch. I can’t wait to read the authors 2nd book.